When I posted my previous card, I told you I would be sharing a new coloring technique with you. On the card I posted HERE, I used this technique on her jacket, belt and purse. The other day I was thinking about Copic markers and how good some of you ladies make them look! I was sitting there fantasizing about ordering them in TONS of colors and being able to color any image I want and have it look good! Then, I started wondering if I could color my images in a different way than I have prior that would look more like Copic markers. I decided I would try to use my dye inks with rubbing alcohol. 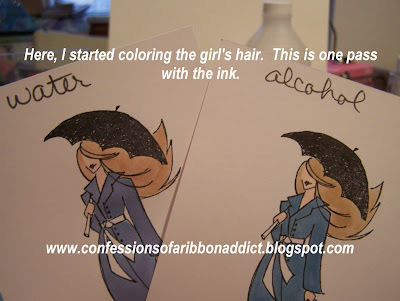 I am not even sure that Copics are made with alcohol, but that is what came to mind. I grabbed a brand new aquapainter (the horror... what happens if this ruins my aquapainter EEK) and filled the chamber with rubbing alcohol. Then, I grabbed another aquapainter filled with water. I prepped 2 palettes with drops of reinker in the same colors. 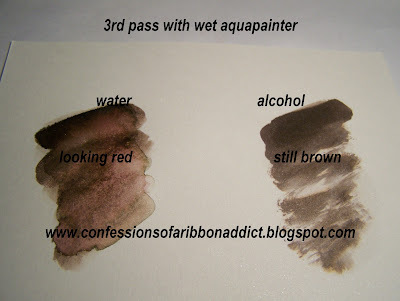 When I watercolor, I place a couple drops of reinker in a well in the palette and then in another well I squeeze my aquapainter and have a little bit of water to mix my ink with. 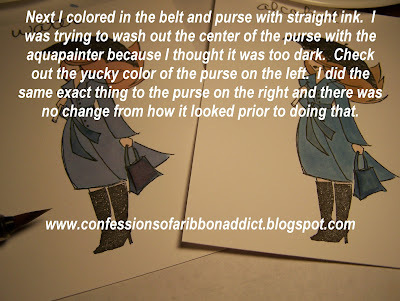 I find it makes a lighter shade of the color I am working with so I can blend my image and add shading. 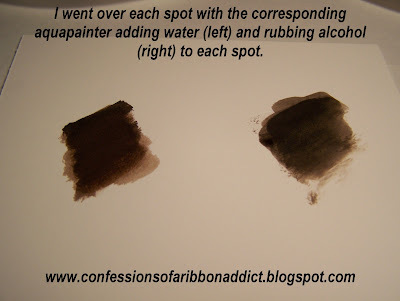 In one palette, I did this and in the other palette I added rubbing alcohol to mix the ink with. 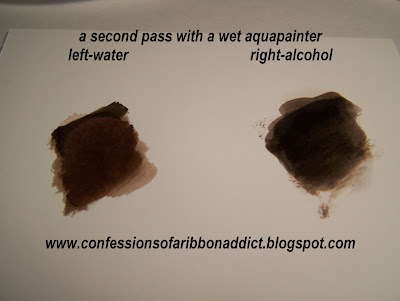 Using my aquapainter, I grab some ink and dip it into the liquid next to it to make a watered down (or alcohol-ed down) version of the ink. You can click each of these pictures for a close-up view! In the picture below you will see I always skip a well so I can make mix my reinker. My conclusion is that the reinker mixed with water causes the colors to morph. 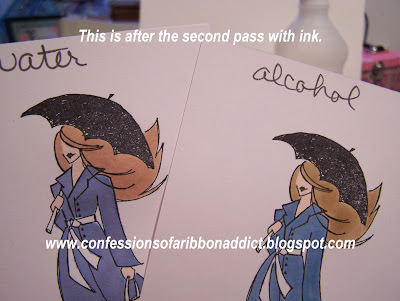 They get easily washed out with multiple passes of ink. This doesn't allow for much shading. 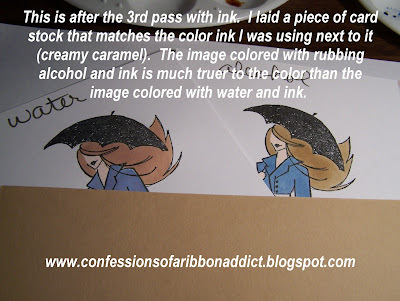 The colors change, the paper curls and ink colors will bleed into each other because the paper stays so wet. 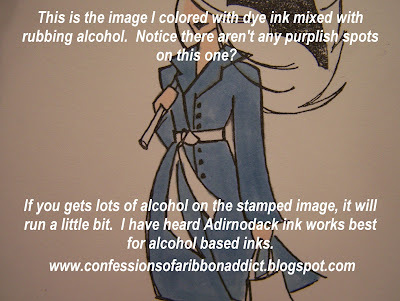 Mixing reinkers with alcohol does not cause the colors to change. 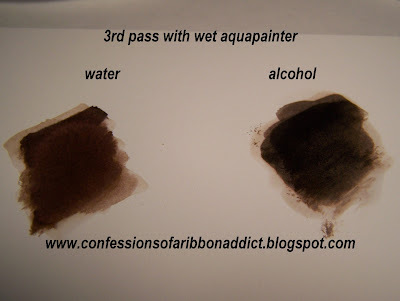 They stay constant regardless of the number of passes with your aquapainter filled with rubbing alcohol. This allows for lots of shading and multiple passes of ink without causing any splotches or wash out of the colors. The ink dries quickly, which helps prevent color bleeding since the paper stays a LOT dryer than when using water to watercolor. 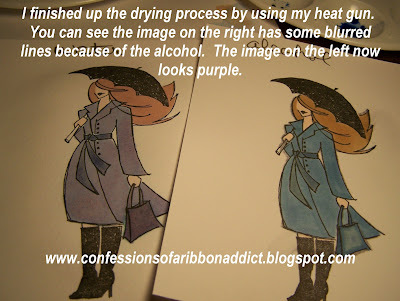 The alcohol will cause the stamped image to blur slightly if the card stocks gets too saturated with alcohol. Again, perhaps with a different ink this would have been less of an issue. 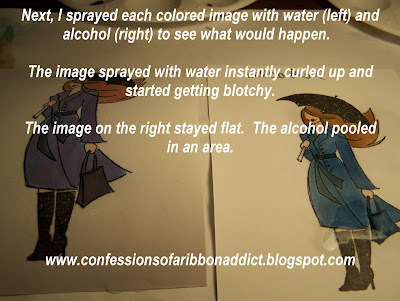 I MUCH prefer the finished image that was colored using rubbing alcohol. 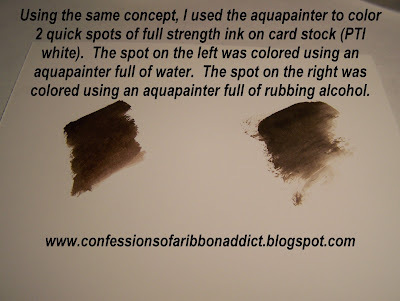 The results of the ink spot test were consistent with the results of the full coloring test. The brown got very washed out on the spot where water was used in the aquapainter. 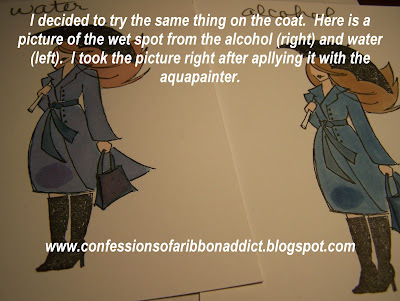 On the spot that used alcohol in the aquapainter, the spot stayed much truer to color and did not have any splotches. For the ink swirl test on a smoother paper (shimmery white) this shows the same result again. After multiple passes with the water filled aquapainter, the swirl looks splotchy, washed out and a totally different color than when the test began. 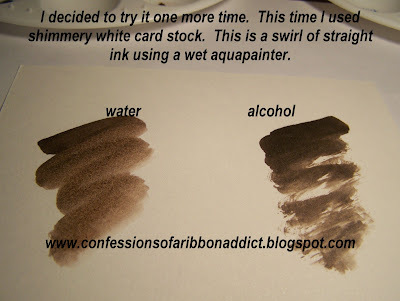 However, the ink swirl that was tested with the alcohol filled aquapainter looks smooth, not washed out and the color stayed constant throughout the test. I am going to keep a dedicated aquapainter for rubbing alcohol! This technique seems to work SO much better than using dye ink with water. 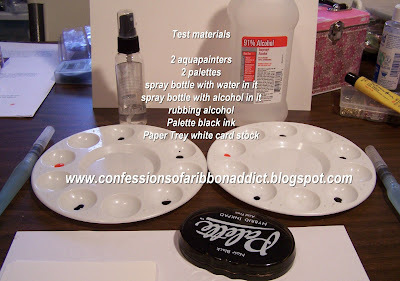 I will be using rubbing alcohol with my dye inks! 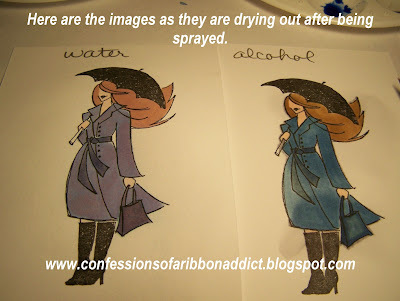 Of course I will still use water for other techniques such as using my watercolor crayons, but I find that the rubbing alcohol creates a much more pleasing effect! Oh my goodness girl! You are a pure genious! I have been trying to figure out how I was going to afford the copic markers. I have a missionary to support in Brazil for 17 more months. I am so going to try this. You made my day! Thank you! Wow, I so appreciate all the work you've done here! This is incredible. Very educational and appreciated! VERY cool! Thanks for all your work to demonstrate this! Looks like I'll be needing to buy a new aquapainter to fill with rubbing alcohol! Brilliant, Jody! I can't wait to try this! thanks for sharing your science experiment with us! 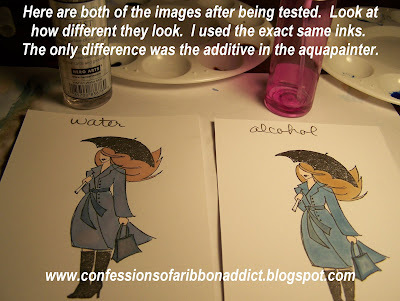 Great idea- I should fill a aquapainter with the blending solution and use my alcohol inks to color with. 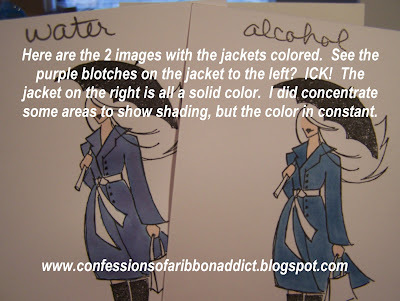 What I wonder about is how to do shading- did just using the alcohol make any spots lighter? maybe just use different ink colors- I'll have to go back and reread your post. WOW...fantastic Jody! What a wonderful explanation---I am gonna have to try this!!! WOW! What a brilliant idea, and what a wonderful way of showing/explaining!! Thank you for this!!! Wow this is great , thanks for the wonderful info , I will definitely try this as it really seems to make a big difference ! You are awesome ! wow.. jody i think it is totally helpful. here is a pic... i could not get the brown spot out of her face on the right side..
i have one question.. rubbing alcohol could this be also gamsol? or is rubbing alcohol in the bottle from cvs or so what you use to clean wounds? can you help me please? 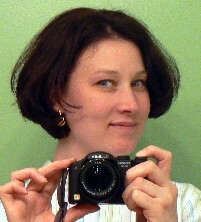 Wow Jody, thanks for all the time and effort put into that tutorial to show us the results!! Great job, will be giving that a try! wow, that is so neat, and I loved seeing each step..DH thought I was going crazy cause I was talking to the computer, "Um hum..hmm..wow, look at that, that's amazing." LOL. Totally awesome and I am definately going to try this!! I will definitely give this a go!!! Thank you so much for the great explaination and examples! LOVE LOVE LOVE the name...hahaha! You're a genious! Thanks for the awesome information, and taking the time to do such a detailed tutorial. I can't wait to try it. I know this will make my watercoloring look SO much better! Thank you, Jody, for taking the time to put together that tutorial. I really appreciate all you did. I am going to try your technique with the alcohol. Again, thanks so much. Love the new blog banner..........now how'd ya do it! Jody, thanks so much for the tutorial and the time you put into creating it. 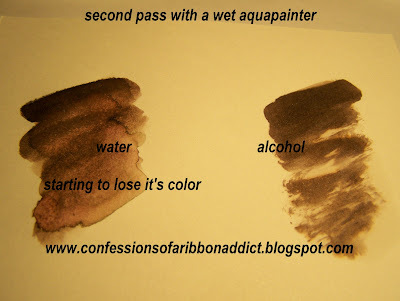 I was using an aqua painter with reinkers the other day and was also not pleased with the results........now I know to try it with alcohol. Wow, how cool is that! You are brilliant!!!!!!!!!!! As soon as I finish my blog browsing I'm going to try this out. Copics are (way) out of my price range and what you've shown with reinkers is pure fabulousness. Thank you for figuring this all out, taking the pictures, etc. 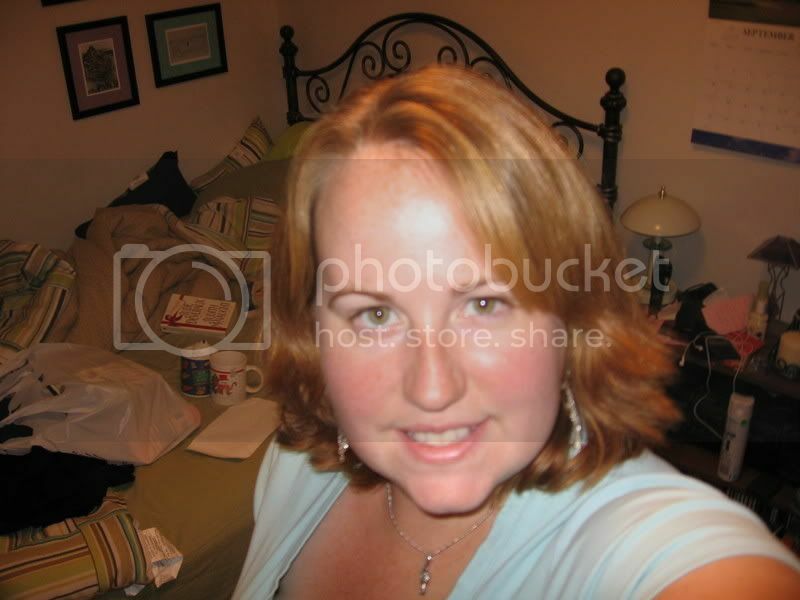 This is very interesting, Jody! Thanks for sharing the results of your research! 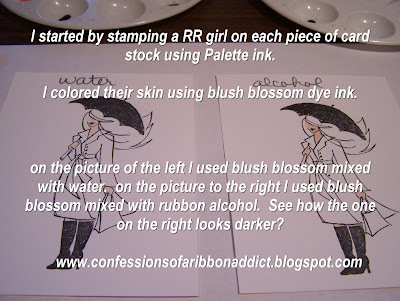 What brand of dye re-inkers did you use? I saw where you mentioned something about Adirondack, but wasn't sure if that was what you used. Jody---YOU ARE SOOOOO AWESOME! The science geek in me was so all over this! The teacher in me was floored with your explanations and clarity of your demonstrations. Well done! I can't imagine the time it must have taken you to put that together. BRAVO and a HUGE shout of THANKS! Now to figure out how to pressure, I mean, persuade my 8th grader to use this for his science fair project (she throws her head back with an evil laugh!) Thanks again -- you are the best! Jody, thanks for taking the time to do all this. It really helped me to actually see the differences. Great photos. This is fantastic. Thank you so much for taking the time to do this. I may have to try it out now. I love this image too. It is on my list to purchase. Again, thank you so much for sharing this. That is amazing. I am pretty new at stamping and soaking up everything I can learn. Thanks for sharing. Your work is beautiful. Thanks so much for the tutorial. 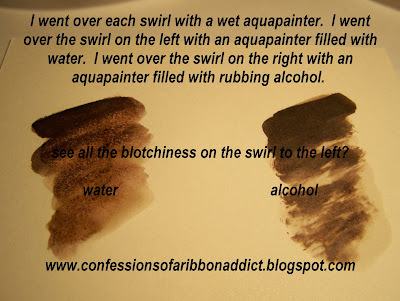 I am definitely going to try this awesome technique of yours....so the alcohol didn't ruin your aquapainter. I, too, appreciate the time and care you took to do this for all of us. AWESOME!!! You go girl! Thanks for the awesome tutorial!!! You rock! Jody, this is SO cool! I can't wait to try it. Thanks for all the detail in the tutorial! Fascinating tutorial! Very well written and researched. WOW! Thanks for saving me hundreds on Copics! I appreciate the tutorial...thanks much for sharing! It's so nice of you to share your findings. You were so thorough and gave such great examples. I guess I need to break down and buy an aquapainter. Thanks so much for the great tutorial!! Awesome! I can't wait to try it. Thanks for the tutorial. Holy cow! Don't ya just love those Ah-HA moments! I would NEVER have thought to try this. The results are amazing! wow! this is wonderful. thanks for sharing your discovery. Wouldn't your highschool science teacher be so proud of you-this would have made a great Science fair project! Great tutorial. Very cool! It's funny because if you think about it, it all makes sense. But who would have thought to do it? YOU!!!! Wow! That was so awesome. Thank you so much for trying this out and sharing with us! I can't wait to try it out myself! Thank you so much Jody! I have hated watercoloring for the very reasons you spelled out! Alcohol is the way to go! Thank you so much Jody for sharing this post. 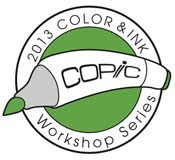 I am going to link it on my blog as I think everyone that doesn't currently own Copic should know. Jody-you are a ROCKSTAR!!!! What a great idea and an awesome tutorial. can't wait to try this out myself :) Thank you!!!!! Thank you, this is wonderful information!! pretty kewl!!!! Does it have to be 91% alcohol? WOW! What a wonderful tutorial! I can't wait to try this. I JUST started buying Copics, but this may just slow me down some. TFS! What a cool technique. I will have to try this. Thanks for sharing. This is so amazing!! Thanks so much for taking the time and sharing the idea! SU should pay you the big bucks - I'm sure this will be the next big thing!! This is brilliant, Jody! Thank you so much for your thorough analysis of this! 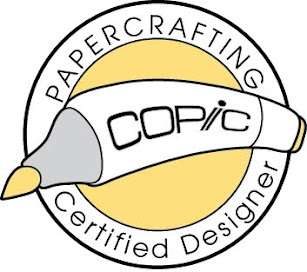 I'm so excited... buying a bottle of rubbing alcohol and an extra aquapainter is WAY cheaper than investing in the Copic craze! Thank you, Thank you, THANK YOU!!! Thank you so much for sharing! 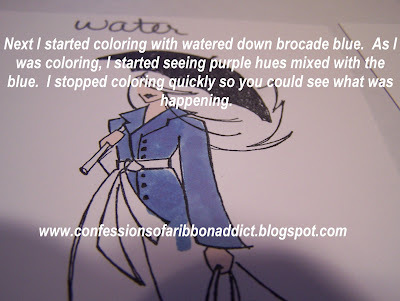 I have also had not so great results with water coloring. I am very anxious to try Drunken Watercoloring. Just the name makes it sound FUN! All you work is appreciated. This is awesome! 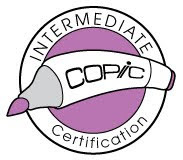 I will be passing this on to all my downline & watercoloring friends! I love to watercolor, but I know I have to get everything "just right" or the color soaks in too deeply and I have to start all over again....grrrr! I already have a spare aquapainter and rubbing alcohol...I can't wait to play! I love your tutorial. Well documented. Now THIS is the kind of science I would have liked when I was in school!!! Great job "journaling" your experiment. Thanks so much for sharing!! You're a genius! Shall we call you Dr.Jody from now on??? hehe. Thanks for all the details and pix! This is great tutorial. thank you for your sharing all your experiments and pictures! Thank you. You are an alcoholic for sure! Do you suppose that part of the water problem is (if tap water) all the chemicals (like chlorine) that are in our water nowadays? What an interesting comparison, Jody! Thanks for taking the time to figure this out and post it. I'm amazed at the difference (and your coloring is beautiful)! Thank you, thank you, thank you! I am always looking for ways to keep using my SU! 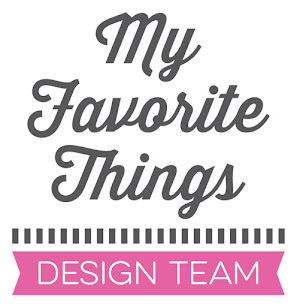 products rather than spending lots of money on things like Prismas and Copics that I cannot use for my business! You are truly a creative mind! :) Thanks for sharing! Wow! Jody that is fascinating! Thanks for sharing! Wow, Jody, thank you so much for this tutorial! Very well done! 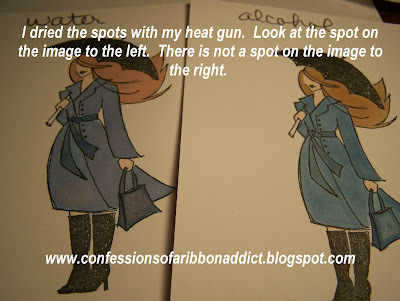 I am wondering...do you think if you embossed your stamped image it would help it to not bleed? 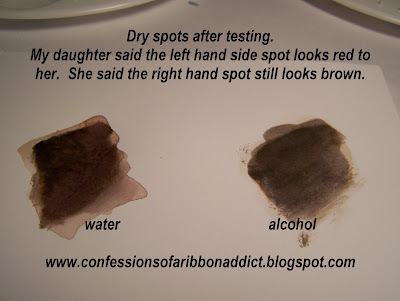 Also, did you use just regular rubbing alcohol? This puts coloring in a new light..